I’ve now been in my place in Koh Samui for 4 weeks, with one week left to go, and I really can’t wait to get out of here. I write this sitting shirtless in front of a fan, with my weather app telling me that it’s “91°, humidity 64%, feels like 108°”. Aside from that unpleasant reality, most of this stay has been not so bad. There’s been a fair amount of reading, plenty of gaming, catching up on TV shows on my TiVo, watching the new Netflix series Daredevil (which is quite good) and a Yahoo series called “Other Space” (a comedic scifi series, reminscent of the Red Dwarf series from Britain; not sure how I feel about it), catching up on some computer maintenance, etc. The internet is pretty good in the morning, a bit dicier in the evenings and weekends when more people are on, but still not bad. Though, for a while, I thought I’d never be able to update my iPhone/iPad to the next iOS version; it might get as far as 2/3 done before bombing due to a lost network connection. I finally solved it by doing the download first thing in the morning, and then the network was clear enough to let it complete. We had 3 days of rain last week, Sunday to Tuesday, and then the place was really lovely. Cool, breezy, relaxed. This happened to coincide with Songkran, a major Thai holiday; I’d heard that Songkran in Chiang Mai is a major water festival, and there are festival grounds where you get sprayed with water, which has got to be nice in the heat. Here, I noticed mainly because of a few fireworks, and some place nearby that had thumping dance/techno music for much of two days, which made listening to the rain a bit less relaxing that it might otherwise have been. Thankfully, we had a power outage for a few hours on the first rain day, which shut them down pretty effectively. Also thankfully, at night the bedroom fan provided enough white noise to make them ignorable. Two days after the rain, the bug population kicked up several notches. I’ve seen a bunch of flying ants, a queue of tiny bugs desperately interested in orbiting my face (I don’t know what they get out of it, but wow they were determined to be there), a few more mosquitoes, a swarm of small winged creatures that landed in a small pile just inside my front door and spontaneously died (all in the short time that I was out of the room). It took several days for all that to die down, and the bugs were nearly all gone by Sunday. I should mention that the front door and the large, rear, kitchen window do not have screens, so if I want decent air flow through the place I have to put up with the occasional critters. This hasn’t been a problem most of the time, but the rain seemed to kick off a bunch of tiny lifecycles. The bugs in front of my face were particularly maddening. I hate killing bugs, but I reached my limit on that real fast. Not that it was easy to clap them out of the air, but it got easier when I realized I could use a hand towel, spread across both hands to make a kind of net, and then mash that net mercilessly once I’d caught them. I always felt bad about it — I’ve captured and released more bugs over the years then I could easily estimate, and always preferred doing that even when it was super hard to catch them. But there were just too many. I finally settled on giving them fair warning, and if they didn’t listen it was on them. “But it’s their nature to buzz in front of your face!” “Yeah, and it’s my nature not to put up with it, past a certain point.” Kumbaya, circle of life. I am Yama, bringer of death to small beings. My wrathful aspect revealed, I move them on to their next lives, until they become enlightened and can perceive my peaceful aspect. You’re welcome. Some long term resident, whom I never saw or heard. The owner Steven told me that this unit has a loft where the bed is, but it’s not particularly ventilated up there so the heat collects. Sounds hideous. Unoccupied about half the time, currently hosting a teutonic couple and maybe a child. Unoccupied about 1/3 of the time, currently hosting a scrawny bald guy in his late 60s who often reads on the porch in the early morning, before dawn. Had a German couple, when I arrived, who were there for about a week, close enough to make me self-conscious about watching streaming TV or Youtube without headphones. But it’s been vacant ever since, so yaay. Me, a scrawny guy in his early 50s with a luxuriant head of hair. Refuses to turn on his AC, sweats a lot. The owner, Steve, and his wife. The wife is home a lot, Steve comes and goes on some sort of computery business. They occasionally get visitors, but I never hear noise from their place. The first week or so, this was a European couple in their late 20s/early 30s, the guy so crazy skinny you could count every rib. (So hot!) Then it was vacant for a week, then occupied by a white, chunky guy in the same age range with reddish brown hair, so pale that I assumed he was British until I heard his American accent. Thankfully, while the beach is a long line of resorts and housing and restaurants, one after the other, we’re far from the few that play nonstop music (dance music in one, reggae at another). But the resort next to us recently gained a family with small children, so in the last 2 weeks I’ve been treated to a small child crying loudly several times a day and a slightly larger child running back and forth with such heavy footsteps that I’d swear he was on the floor above me, if I didn’t know better. One evening, during Songkran, I was coming back from dinner at the Swiss-Thai place down the beach, and it was getting dark and I could see a fire on the beach like some kind of party was going on. It was beyond where my place was, and I wouldn’t have gone that far, but as I got closer part of the fire lifted into the air in pieces and started rising, like some kind of snake swimming into the sky. It was completely unexpected and magical. 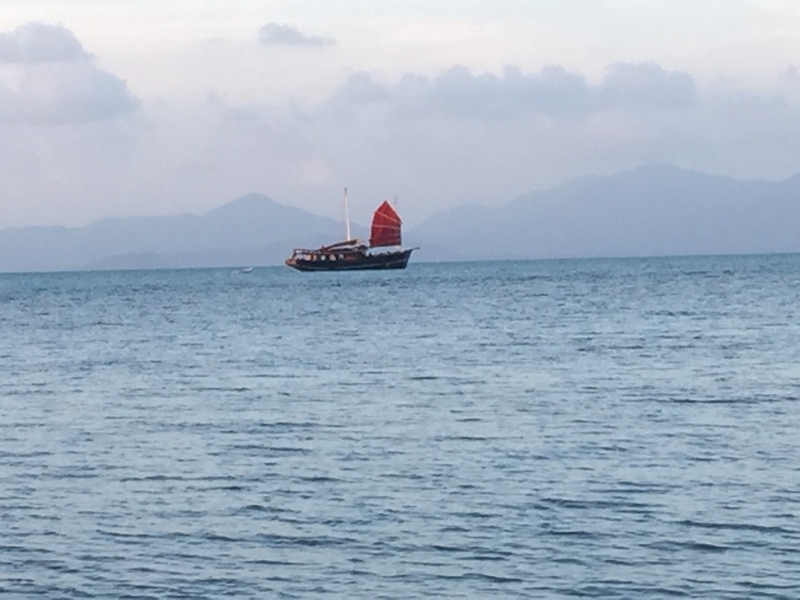 Only 3 pieces rose, at first, and then they started floating westward down the beach towards me, but they were high enough by the time they got to me that I couldn’t see what they were — though I guessed it was some kind of balloon lifted by a small fire in its basket. I stepped up my pace to get to the remaining fires, and then the rest of them lifted up the same way and drifted across the sky. 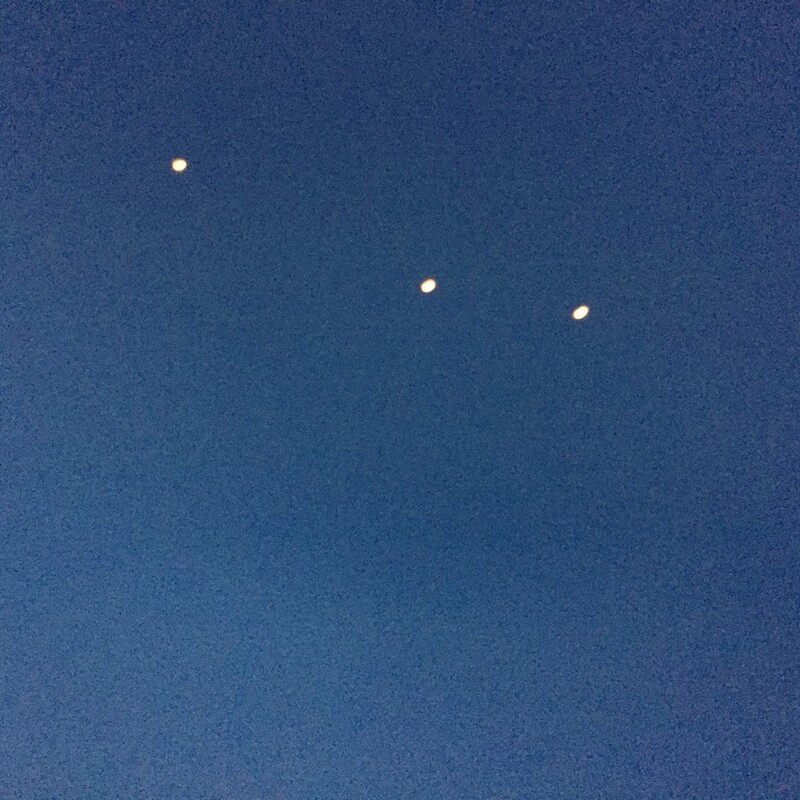 For those, I was close enough to see the cylindrical balloon above the small fire, and they headed west and slightly north out over the ocean. My iPhone camera really can’t do these justice. I often walk the beach around sunset. It’s a little cooler, there’s much less risk of burning, the sun’s down on the way back. It’s moderately busy, with tourists, locals, and dogs (and once, two guys walking their water buffalo), and it’s sometimes hard to find a firm path where the sand hasn’t been churned up by beach goers earlier in the day. My place is about midway between the northern and southern ends of this stretch of beach, and each end has a terminator (a resort on one end, a cliff on the other), and either direction is good for a really brisk, 30 minute walk, roundtrip. (I pretend I’m walking to the Bedford Hills train station and Brandon and I have left just a few minutes later than we should have to catch the next train. This does not stretch my imaginative faculties in any way.) There’s never enough breeze to keep me at an even temperature, so by the time I get home I’m pretty sweaty and disgusting, so I take a cold shower and then fix dinner in front of the fan. Showering after a brisk walk along the tropical beach really makes me feel close to the earth, another body that has such vast reserves of internal heat that the sun could go out and the oceans freeze over and it would still be hot enough to melt rock and move continents for billions of years. I’m saying the shower barely helps. In case you didn’t get that. This is probably a tourist boat, though I can’t be sure. But then, the dhow that can be named is not the true dhow. About as classic a tropical sunset image as one could hope for. 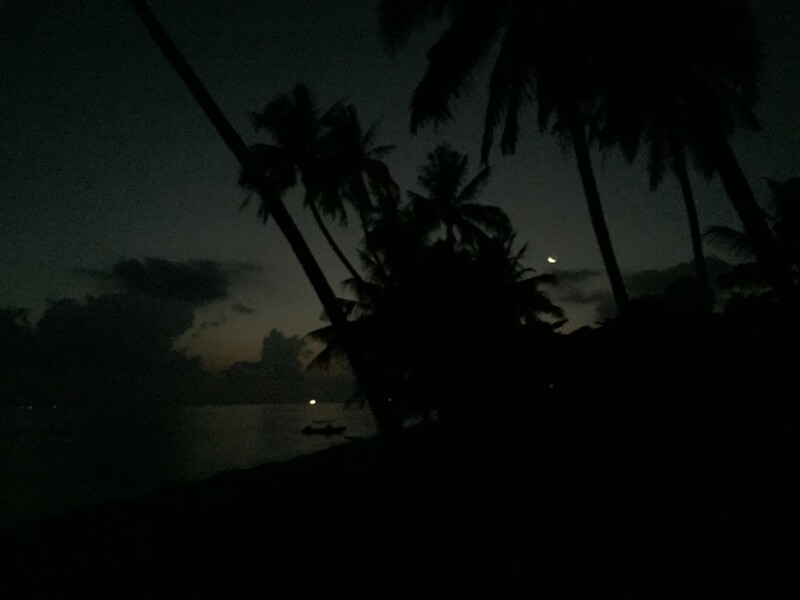 Sitting out by the beach in the pre-sunrise, watching the moon. One can hardly sit and read in such low light — well, I guess I could have, with my Kindle app, but I didn’t — but this still seems like a good time to mention the next book: The Atrocity Archives, by Charles Stross. The basic conceit is a British MI5 (or 6, or whatever all those numbers mean over there) that instead of dealing with Cold War threats deals with the immanent threat of invasion by Lovecraftian horrors that can drive men mad. Though, in truth, most of their time is taken up by pedestrian things like meetings and paperwork, just like real spies. (Think Men In Black, but with eldritch terrors instead of aliens, and with more cubicles and tedium.) The protagonist is an agent/mathematician, involuntarily recruited years before because he stumbled upon a mathematical proof that could open the door to such horrors — apparently, people discover these sorts of things fairly frequently, and the agency (known as the Laundry) has to clean it up when it happens. It’s written as a comedy, structured around action and horror and office politics, and I loved it. 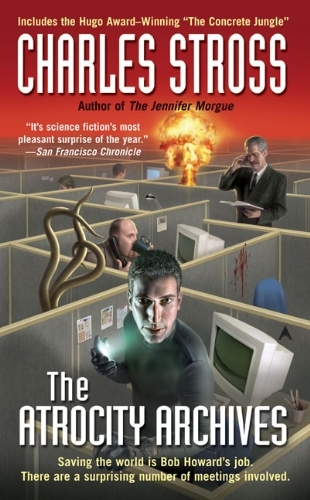 I’ve been hearing Charles Stross’s name as a scifi author with increasing frequency over the last few years, and I was glad to finally get to one of his books. I’ll look forward to reading a bunch more, now. So, it’s been nice to have several weeks that I didn’t have to plan where I was living next. In fact, I could stay here if I wanted. The place isn’t booked at all solid and at least I can breathe. But I’m really done being hot and sweaty. I could go back to Chiang Mai (where the passport card I applied at the US Consulate for is waiting for me), but I gather that the rains don’t really start again until May, and I really want the air to clear out there before I go back. Like, really really want that. Plus, I have to leave the country by April 30th, 90 days after I entered, even if I just walk across the border and then turn around and come back. So, some trip out of the country is required. I’d been thinking of Kuala Lumpur, Malaysia. It’s close, and there’s a great train service with a supposedly really nice sleeper car, or I could fly there from the island’s airport. That’s what I’d been intending for a few weeks. But the longer I was sweating here in southern Thailand, the less I wanted to go someplace even further south. So, where would be cooler? Nepal. It’s in the foothills of the Himalayas (and includes the headhills as well), and as I write this in the late afternoon, instead of being “91°, feels like 108°“, it is “74°, feels like 74°“. Much better. It’s outside of the range that my inexpensive health insurance policy covers, but I’m covered for trips out of the southeast asian area for up to 7 weeks at a time, so I’m good. And Nepali visas, which you can get on arrival, come in 14-day, 30-day, and 6-month periods, so a 30-day visa would be perfect. I was last in Nepal 20 years ago, for a month-long trek through the Annapurna Himalayas. I’m definitely not doing that this time, but I figure 2 weeks in Kathmandu, the capital city, and 2 weeks in Pokhara, the second major city, should do nicely, and I’ve booked Airbnb places for both, here and here respectively. Both cities are very walkable, Pokhara especially, and there are a lot of tourists and trekkers, and English is fairly common (it having been British ruled at one point). The worst downside: Nepal’s is a bit shaky when it comes to having a steady power supply, and brownouts are common. I think internet may be Ok, given the speeds I’ve seen for hotels on the HotelWiFi website, and some of these places have backup power supplies… we’ll just have to see. Worst case scenario: I may be off of Elder Scrolls Online for much of the month. My biggest quandary was whether to stay in the city, or not. There were some great places a little outside both cities, with amazing Himalayan views. But if there’s one thing I’ve learned in these last 3 months (as if I didn’t know it already), it’s that if I can’t walk there, I’m probably not going. Better to be in walking range of things, and have an excuse for the exercise. If I come back later, on another trip, maybe I’ll stay a little further out, if I want to. 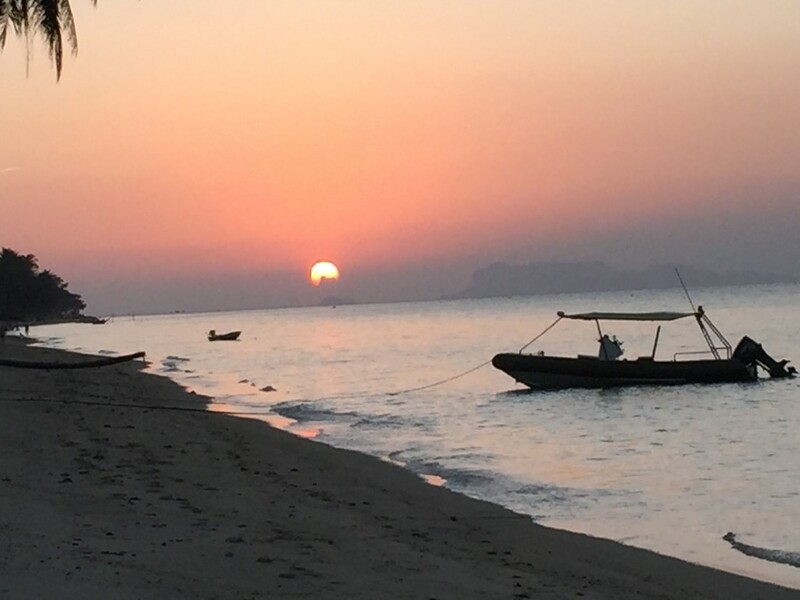 So, I leave Koh Samui at 5:50pm on April 27th, fly to Kuala Lumpur to overnight at an airport hotel, fly out to Kathmandu in the morning, and then plan to leave on May 26th and go back to Chiang Mai. Will I stay in Chiang Mai, once I’m there? Who knows? Finally, it’s getting time to start thinking about my fall/winter trip back to the US, and where I go afterwards, so that I can make good, cheaper plane reservations and get the nice frequent flier mile upgrades. I’ll be in touch with the usual suspects to work out the details of what’s good for everyone, but the rough plan has me arriving in LA in mid-November, visiting the more westerly people in November/December, heading to New York in January, and then from there… the next World Destination will be in Europe, at least initially. So, I think that’s about everything. Except, maybe, given the Winter is Coming topic, I guess I could include this. It helps if you know Game of Thrones at all, but even without that benefit… So. Funny. This entry was posted in Uncategorized and tagged Armandos, beach, bugs, Charles Stross, Croatia, Daredevil, hot, Jon Snow Dinner Party, Kathmandu, Koh Samui, Kuala Lumpur, Nepal, Other Space, Pokhara, rain, Songkran, The Atrocity Archives, winter. Bookmark the permalink. I think it’s great that you will be going to Nepal – at least you will be able to cool off. I especially love your accommodations in Pokhara…. Very modern looking. And thanks for the game of thrones video – it was hysterical. Also looked at some of the other videos it offered – all hysterical.